When you need a cute costume and someone to save the universe from the tyranny of Darth Vader, this costume is your only hope. 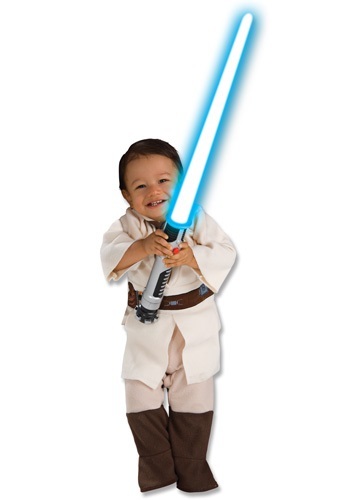 Whether your child is a Ewan Mcgregor look alike or they just seem like they might have a way with the force, your little one will be able to get away with anything in this white tunic. They might sneak a cookie and when you ask them who stole the cookie from the cookie jar you just might get a new answer. They'll simply wave their hand in front of your face and say, "This is not the baked good you're looking for." We're not sure what baby's first lightsaber looks like but we are sure that it's never too early to join up with the light side. You don't have to start off their training with lasers just see if they can change your mind with just a look. Yep, those puppy eyes are an actual power. Bet you didn't know that! Give your little one the chance to become one of the greatest Jedi who have ever lived. Obi Wan Kenobi was trained by Yoda and Qui Gon Jinn in the ways of the Jedi order and then trained young Anakin Skywalker to learn the ways of the force. This Jedi has been across the galaxy helping out those in need and bringing down the terrible Sith Lords. But one day he'll meet a young Luke Skywalker and push him in the right direction to save the universe! "The Force will be with you, always"